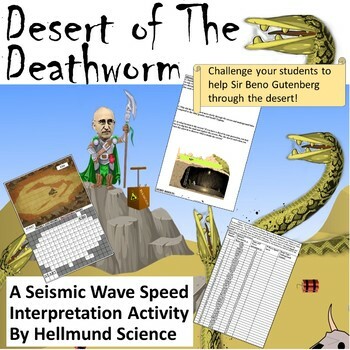 Challenge your students to assist Sir Beno Gutenberg's journey across the dreaded Desert of the Deathworm by using seismic wave data! 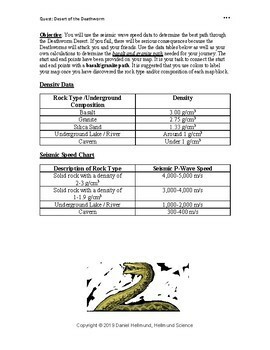 This quest will allow students to calculate the average speed of seismic waves, specifically P-Waves, through various substances such as basalt, granite, silica sand, and more! But beware, one misstep and their characters will be attacked by the fiendish and vicious Deathworms that burrow through the loose silica sand! This quest utilizes concepts of seismic waves, wave speed, and density in an truly unique way that can be used to bolster student understanding of how we can develop detailed models of Earth's interior despite being able to dig through the Earth's crust. 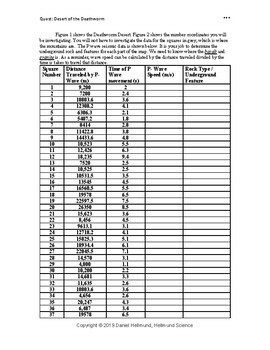 This assignment can be given as an individual activity or a pair activity. Worried about grading? Don't despair! Students will color the safe route to allow for quick assessment analysis! -I can define seismic waves and describe how they are created. -I can interpret seismic data and infer the composition of the materials through which it is passing. -I can calculate average speed using distance and time measurements. 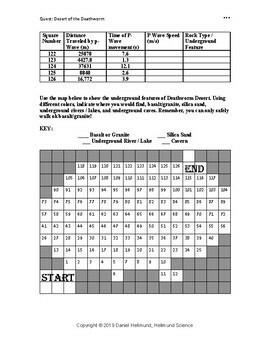 Within this download you will get a suggested lesson plan, the student quest handout, answer key, and a card sheet. Don't forget to follow Hellmund Science and provide feedback!